Puppy Pose is a variation of the popular downward dog. We can use puppy pose to extend our spine while increasing flexibility in the chest. Puppy pose is often referred to as heart-melting pose because it brings the heart close to the ground. When doing this pose, invite kids to make puppy noises or wag their puppy tail in the air. Ask the children to settle into this pose if they need something calming—to help manage their emotions and feelings. 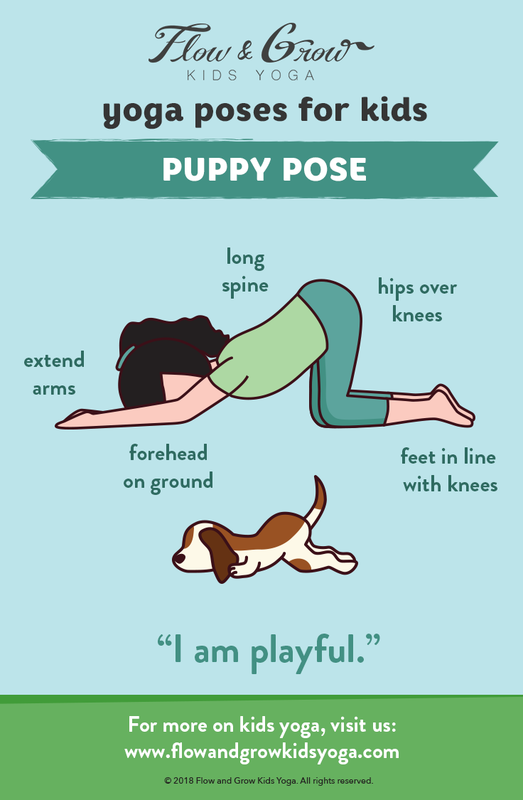 From puppy pose, kids can then settle into child’s pose. This pose reduces or eliminates visual distraction. *Reducing what is taken in by the senses is called Pratihara in yoga. We purposefully offer poses that reduce sensory input to heighten other senses and reduce distractions. This can help children get closer to a meditative state. Come to all fours on your hands and knees. Keep your hips lifted over your knees and walk your hands forward to lower your chest. Lower your forehead to the ground and let your neck relax. Spend a few moments in puppy pose. Make puppy noises while in puppy pose. Wag your puppy tail left and right. Ask children to stay in puppy pose for an extended period. Have them use this time to manage their emotions and feelings, and to be in the moment. Extends the spine, a wonderful counterpose to our spine being shortened from sitting and texting. Increases flexibility in shoulders, chest, and hips. Activates the stomach muscles; great for aiding digestive issues.